This has been an eventful fall/winter for breast imaging. The American College of Radiology (ACR) and Society of Breast Imaging (SBI) continue to stand up for patients in the face of repeated calls for breast cancer screening to start later in life and to be performed less often than ACR/SBI guidelines call for. The American Cancer Society touched off a firestorm in October by recommending that women 45–54 get annual mammograms and that those 55 and older transition to biennial screening. The ACR and SBI responded strongly and scientifically opposing delayed and less frequent screening that would result in thousands of unnecessary breast cancer deaths each year. The joint response was covered in more than 320 print and online news outlets — including every major newspaper and online news outlet in America. The average monthly visitor and circulation figures for these news outlets totaled more than a billion readers. Our response to the ACS guidelines was also covered by National Public Radio (NPR) and scores of local TV news stations nationwide. As part of our ongoing effort to preserve patient access to mammography, the College posted (and continues to post) regular messaging and resources to ACR Facebook and Twitter pages and the MammographySavesLives.org Facebook and Twitter pages. 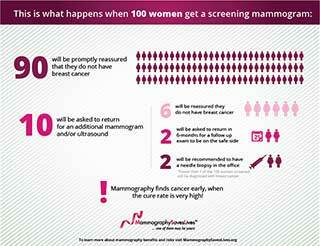 The ACR offers an infographic to put the “harms” of breast cancer screening in proper perspective. We also offer a brochure for members to display in their waiting rooms/lobbies and a pamphlet to send to referring providers explaining why starting annual screening at age 40 is so vital. Another brochure (in English and Spanish) explains how breast density affects mammography accuracy and women’s risk for getting breast cancer. During National Breast Cancer Awareness Month, ACR’s social media activity jumped. For example, ACR Facebook posts reached 66.3 million followers; Mammography Saves Lives Facebook items reached nearly 1.1 million individuals. I know that many of us either have had meetings with colleagues, hospital administrators and patients to explain radiology’s stance that screening start at age 40. I invite you to check out the Breast Imaging Resources page on the ACR website and use the information there to help with discussions with providers and patients alike. Please share points that have resonated with your practice and hospital administrators in the comments section below. 1 – ACS offered only a “qualified” recommendation for annual screening in women 40-44 and those 55 and over. 2 – The College does not sell these brochures, but feel free to download the file(s) and print as many as you like. The ACR does not give permission for the file itself to be changed in any way.